Aww, she’s asleep. Now I can finally rest! Wait, is she still breathing? Whew, yes, her chest is rising. Now to catch that nap. Wait, that breathing looks fast, is she okay? I’m not sure about you, but I know when I’ve had newborns, I have spent a lot of time watching their breathing. This was especially true of my first three, who were born out of the hospital. I was instructed to watch their respiratory rate until our follow up a couple of days later. Why Do Babies Breathe So Fast? To my surprise, I learned babies breathe a bit differently from adults or older children. Thankfully, my midwife explained this to me. Newborns breathe much faster than adults. They also have irregular breathing patterns. It can be worrying, especially when you welcome your first newborn, but different respiratory rates and breathing patterns are completely normal. Why Do Babies Have A High Respiratory Rate? Compared with adults, babies breathe very fast. At first, it might seem like something to be concerned about, because rapid breathing is usually an indication something is wrong. However, for babies, a ‘normal’ respiration rate is higher than ours. A newborn’s lungs almost completely fill the chest cavity. Unlike adults, they don’t have air reserve in between breaths. Until they grow and have a more expanded chest cavity, their respiratory rate is higher than in older children and adults. Once there’s more room in the chest cavity, some air reserve remains in the lungs between breaths and the respiratory rate is lower. What Is The Normal Respiratory Rate For Babies? Bringing a newborn home can be a bit scary for many parents. Though most babies are quite healthy and strong, they still seem fragile and vulnerable. Many of us watch our sleeping newborns to be sure they’re still breathing. In the absence of genuine health issues, however, we shouldn’t obsess over their breathing. Knowing the normal respiratory rates and patterns for infants can quickly reassure us our babies are well, or help us decide when to contact the doctor. Adults: 12-16 beats per minute. How Can I Count My Baby’s Respiratory Rate? When clinicians take your vital signs, like your pulse or respiratory rate, you might notice many count for only 15-30 seconds. Then they multiply the number they counted (by 4, or by 2) to get an idea of your rate per minute. Although this quick measurement works well for adults with regular breathing patterns, it doesn’t work for infants. Babies, especially newborns, have irregular breathing patterns. It’s important to count their respirations for a full minute to get an accurate respiratory rate. You can work out your baby’s respiratory rate by counting each time you see her chest rise, or by placing your hand on her chest and counting each time you feel your hand rising. The number of times her chest rises in 60 seconds will give you her respiratory rate. How Often Should I Check My Baby’s Breathing? Typically, your newborn will have been assessed by a skilled healthcare provider before you’re fully responsible for her wellbeing. If there were any major respiratory concerns, your baby wouldn’t have been discharged from care. If you have a home birth, or give birth at a freestanding birth centre, you will usually be discharged about 4-8 hours after birth. During the immediate postnatal period, your midwife will check your baby’s vital signs and make sure she’s safely adjusting to life outside the womb. If you’re discharged and not transferred, rest assured your baby is showing all the proper signs of good health. Your midwife will instruct you and your partner on how often you need to check baby’s vital signs until she comes back to follow up. You should take your baby’s vital signs as often as recommended. If you need more reassurance, you can obviously check more frequently, but make sure you also find time to rest. If you give birth in the hospital, the medical staff will taken your baby’s vital signs as often as they feel necessary, based on how baby is adjusting. Once you’re discharged, your baby won’t need regular vital signs checked at specific intervals. However, if you’re doing an early discharge (less than 24 hours) staff might recommend you take vital signs until you follow up with another healthcare provider. 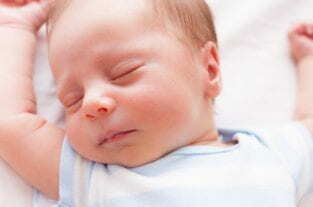 It’s normal for parents to worry about their newborn’s breathing, especially while the baby is sleeping. You can take a minute to count her respiratory rates as often as you feel necessary, but make sure you’re not doing it so often you can’t rest. In the absence of health issues or concerns, and if baby’s healthcare provider hasn’t said otherwise, it’s okay not to take regular vital signs of your baby after you’re discharged or you’ve had appropriate follow ups. Simply watching and noticing her chest rising and falling is often enough to reassure you; then you can go back to sleep yourself. Babies wake to feed quite often, which is also a great reassurance she’s doing well. It’s important to be aware newborns take pauses in their breathing. This shouldn’t be confused with apnea, which is when they stop breathing. Pauses are normal; babies are simply learning to regulate their breathing. Why Do Babies Experience Pauses In Breathing? In utero, babies practise their breathing movements, but all of their oxygen is delivered via blood in the umbilical cord. As soon as babies are born, they go from having to do very little, to having to breathe, eat, regulate their body temperature, and send cues so their parents meet their needs. The adjustment to life outside the womb is quite a task for newborns. As they’re learning to adjust, sometimes they experience periodic breathing, or a brief pause in breathing. This happens most often during a deep sleep, but it can also happen in any state. If the pause is only for up to 10 seconds, it’s within the realm of normal and rarely something to be concerned about. These brief pauses are usually followed by a gasp or a few rapid breaths. This irregular pattern is the reason why infant respirations are counted over a full 60 seconds. If you are uncertain about your baby’s wellbeing at any time, especially when it involves her breathing, you should contact the doctor, a health visitor or any appropriate healthcare provider. Anything else about your baby’s breathing that causes you concern. I’m Too Worried To Sleep, What Can I Do? It is normal to worry about your baby’s wellbeing in the early days and weeks. Knowing the normal respiratory rates, and being aware periodic breathing can be normal, will help reassure you your baby is doing well. If you’re a first time mama, the mother of a preemie, or you’ve had a baby after a previous loss, the normal worries can easily become overwhelming and interfere with resting, and enjoying your new baby. It’s important to remember your baby’s healthcare providers wouldn’t have discharged her to home if there were concerns about her wellbeing. Apnea monitors are available, but most healthcare providers advise against using them unless a medical grade monitor is prescribed for a specific reason. In general, most parents find they produce lots of false alarms, which further disrupt rest. Although SIDS is one of the biggest concerns new parents have, it is incredibly rare, especially if you follow appropriate guidelines to reduce your baby’s risk. In Australia, SIDS occurs at a rate of just 1 per 1,000 babies. Any risk of loss is understandably scary, but you can reassure yourself by following safe sleep guidelines. You can learn more by reading What Is SIDS? 6 Things Families Need To Know.